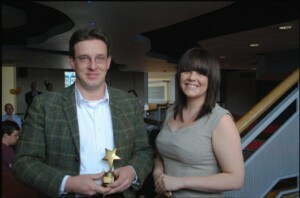 Prof. Peter Kruschwitz receives Gold Star Award from Kara Swift, RUSU VP Academic Affairs. I was thrilled to win the coveted Gold Star Award 2012-3 – an award made by Reading University Students’ Union (RUSU), based on student nominations of lecturers that have made a significant difference to their studies at Reading. With only one such award per year per Faculty, this was a rather overwhelming experience, and I could not be more pleased that my work appears to have made a difference. Most of all, however, I was ever so delighted to learn what my students had highlighted in their comments: the strong academic culture of the Classics Department, and the support we all are always ready give to each and every individual student. A couple of months ago, the department underwent Periodic Review. Periodic Review is a compulsory, regular quality assurance exercise for all departments at the University of Reading, and the remit of the panel is to endorse the continuation of all taught programmes in the department, provided that they were to be found of sufficient merit and quality. Moreover, the members of the panel, consisting of external subject specialists as well as colleagues from the University of Reading outside our subject area, are asked to identify both good practice and areas for improvement in our provision. To be honest, Periodic Review is not everyone’s most favourite exercise, considering the amount of documentation and preparation that is required. The Department of Classics, however, took its usual constructive view: we talk about the development and improvement of our taught provision all the time anyway, so why not use this as an opportunity to reflect on this central part of our role somewhat more generally? We have now received the panel’s report, and I am delighted to say that the report was nothing but glowing. We were found to be an engaging, welcoming, and friendly community, where both staff and students convey an impression of enthusiasm, dedication, and pride in the department. The panel felt that our mechanisms for maintenance and enhancement of Teaching and Learning were exemplary, and they commend us on our collegiate academic community, in which the development of our students is seen as a cherished goal, based on our engagement in high quality research. The panel was particularly impressed with our research culture, which includes staff-student collaborative research projects and student attendance at research seminars. This is also reflected in our strong culture of exploration and innovation in teaching, for example in our second- and third-year modules that allow our students to design their own research projects, that encourage enquiry-based learning, and allow for inclusive teaching and learning through a diverse, yet challenging range of assessments. Finally, the panel noted a high level of student engagement in gathering feedback to enhance the quality of the Department’s academic provision, achieved through informal channels, such as a strong open-door culture and regular non-teaching contact between staff and students (if only these truly delightful aspects of our jobs could be reflected in the government-imposed datasets…), and through our more formal Staff-Student Liaison Committee. Can we improve further? Yes, we can – and yes, we will. Based on the feedback of our review panel, our students’ constructive criticisms through all channels, formal and informal, we are currently looking into areas where we all feel we could do even better, and I hope we will be able to give an update on progress in these areas soon.